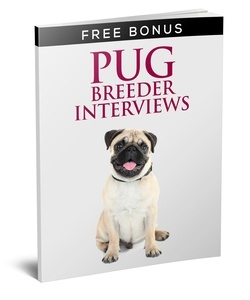 These exclusive breeder interviews are our way of thanking you for buying our best-selling owner’s guide to the Pug. We had huge involvement in the book from 37 Pug experts. We just couldn’t include all the interviews in the main book because our printing costs would have been astronomical! We may well be adding new stories and interviews so we strongly suggest you add your email address in the box further down the page so you don’t miss out. We can then let you know if and when we have any further updated editions of the free bonus book. This will then show you the book on your screen. You also have an option to download it to your computer so you can keep and read it anytime – just right-click with your mouse, and choose the ‘save as’ option to download it onto your computer. I hope you enjoy your free gift:). PS – CAN WE PLEASE ASK A SMALL FAVOUR? Please consider helping us by ‘paying it forward’ – posting a positive review really does help us reach more people. We really want to get this helpful book to as many Pug owners as possible. Most people don’t realise this, but the more excellent 5-star reviews we get actually helps our book get shown higher up on Amazon and adds more credibility for undecided buyers, so it REALLY is important for us. If you feel we can improve our books, please contact us directly as opposed to leaving permanent comments online. We are more than willing to change and improve any of our pages. If you have any comments to help us improve the book, then I would love to hear them personally and we can then revise the book as necessary. This is far more constructive than leaving a harmful negative review. Add your email address in the box below so we can let you know if and when we have any further updated editions of the free bonus book. It doesn’t get much better than this – our lovable dogs are about to go on a vacation/holiday of a lifetime to iconic destinations around the globe. Our innovative and completely original artwork contains 26 hand-drawn, single-sided detailed illustrations covering popular destinations such as New York, London and Paris. 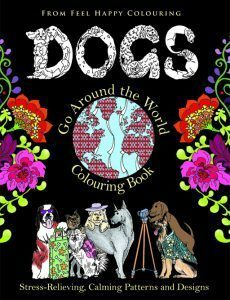 The last page confirms the locations our lucky dogs visited. I would want to be kept updated if you publish more interviews from pug breeders. Also, I left a good review on Amazon CA because I really think you made an amazing job with this book, it will help me a lot. I love this book! So far I have purchased 4 pug books, and this is my favorite. I love hearing from the breeders, and two of them that are listed in the book are the breeders of my pug, so that was doubly exciting.